Lane Kennedy joins us today to empower you to live in alignment with your values to live your fullest life without burning out. Like most of us, maybe you, she has endured periods of burnout. She wants to inspire you to stop and reflect more before burnout forces you to do so. 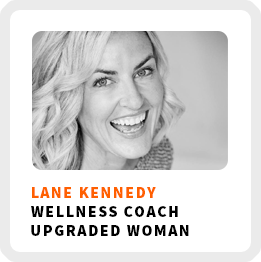 Lane is a wellness coach, a writer, a podcaster, and a biohacker helping people live healthier, happier, and more satisfying lives. Learn more about her work at Upgraded Woman. Lane’s career was guided by what she wanted to do, not what she thought she was supposed to do. Why you need to become a self-directed learner. Why your values are the foundation of our decision-making process. How her approach to mindfulness-based stress reduction opens her clients up to new ideas. If you aren’t into meditating, Lane offers some alternatives. Core work activities + habits: 1) Constantly be talking to people. 2) Being in community. 3) Following up. Definition of success: When she falls asleep, if she’s happy and asleep within 6 – 7 minutes. Regains focus by: Looking out the window into the bay. 90-day goal: Increase revenue, bring on a new teammate, get her book published and out on Amazon. 1) Take time to think about what you want your life to look like. 2) Write down what you want to get it out of your head and onto paper so that you can visualize it.